The “Phat-Brace” is unique as it is the only AFO that can produce a functional replacement to calf strength deficit. This functional force can be utilized in two patient applications. The first is to replace weak or absent plantar-flexion strength. Returning the patient to a normal bio-mechanical gait with a propulsion force, including the patients control of variable Cadance. This propulsive force in gait is also functional to return the patient standing stability. Both standing stability and propulsion are gained, while maintaining the patient’s proprioceptive balance. The second application of this AFO design is for the function of Queing the knee position. Specifically controlling excessive knee flexion and hyper extension in standing and stance phase of gait. 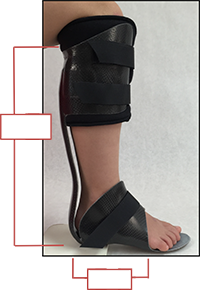 Because the orthosis "Does Not" produce a rigid stop, as seen in conventional AFO designs, this orthosis creates a corrective force without limiting the patient function or balance.